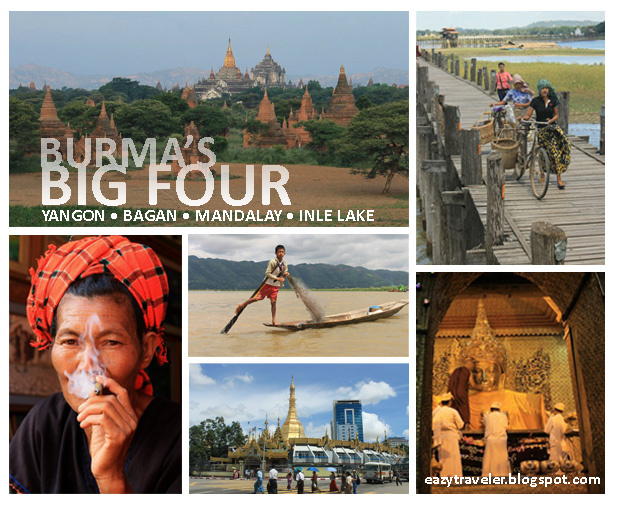 Taking advantage of overnight trip aboard private buses, this packed itinerary will reward you with the best sights around Burma’s ‘Big Four’ – Yangon, Bagan, Mandalay and Inle Lake – in only a week. Yangon and Mandalay can each be explored in a day, so we spent more time in Bagan and Inle Lake which is best enjoyed when you take your time. We didn’t want to spend a night in Yangon so we booked the bus for Bagan days in advance through a travel agency, who were kind enough to allow us to conveniently leave our luggage at their office while we explored the city on the first and last days of our trip. If possible, book bus tickets a day before departure. In Mandalay, we bought our tickets in the morning. Innkeepers and drivers can assist you in purchasing bus tickets. Watch our video clips from the trip! 3:30 AM: Bus arrives in Mandalay. Hire a blue pick-up taxi for a full-day tour (MMK 30,000 for 6pax). Buy bus tickets for Taunggyi (Inle Lake). 3:30 PM: AC Bus to Yangon (USD 20 or MMK 15,000, 15 hours) – QUEEN INN sells bus tickets. 6:30 AM: Bus arrives in Yangon. ON GOVERNMENT ENTRANCE FEES: Independent travel can be beneficial to the Burmese people by minimizing the money that goes to the government and supporting private companies and local industries. Avoid paying government entrance fees by looking for alternative entrances, dressing up like a local (if you look Burmese), or, as we did in Mandalay, ask advice from your taxi driver. What an impressive shoestring budget you’ve got here! I’d like to visit Burma one day and hopefully contribute tourist dollars into local businesses that they may thrive (and not directly support their dictatorial regime). Myanmar is my fave place in SEA so far. Definitely a must-see before mass tourism flocks in. Thanks for sharing! Definitely useful for our Myanmar trip next year. By the way, is it possible to cover all four places in 5 days? Love reading ur blog..got introduced by Nathalie Penados…this is much more than what i need for my next travel to Myanmar this coming December..It’s gonna be a 7-8 days playin’ local in Myanmar..;). May i know where did u printed the visa from?? any particular and safe sites??? Hi Millen, thanks so much for reading and sharing your thoughts! Visa application info and other pre-trip essentials on my other post: http://www.eazytraveler.com/2011/07/burma-basics-visa-application-money.html Good luck on your visit to Burma! Thanks for this EAZY! 🙂 My sister and I are planning a trip to Burma this year, on a budget of course, and this will greatly help us. How’s the security situation over there? Hi Reiza! Burma is getting safer and safer to visit because its government is transitioning into a democracy. I believe visa-on-arrival is now available for Filipinos =) Enjoy your trip! Thanks for this entry. Very very useful. I also have 7 days to cover my Myanmar adventure this coming November. I will definitely copy this itinerary.